Another great article from the Bahamas. 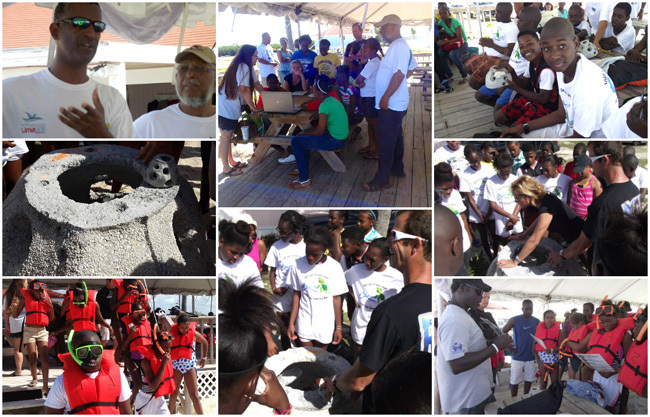 FREEPORT, Grand Bahama — On March 26th, 2016, the EARTHCARE Eco Kids Saturday Environmental Education Programme continued at the Rand Nature Centre in conjunction with Cheri Wood, Certified Coral Propagator and the Royal Bahamas Defence Force Navigators. Ms. Wood taught the combined group about the largest Reef Ball project in the country in our very own backyard. Ms. Wood, a Certified Coral Propagator, has been intimately involved in the Reef Ball project from its inception. She shared with the group many details of the very exciting science project located at Paradise Cove Beach Resort in Deadman’s Reef on Grand Bahama Island. The Royal Bahamas Defence Force Navigators with Cheri Wood, Certified Coral Propagator, EARTHCARE Eco Kids with Gail Woon, EARTHCARE Founder and a Director of Save The Bays after an informative lecture by Cheri Wood on the Reef Ball project at Paradise Cove Beach Resort.After the informative lecture, the buses loaded up and the young people headed to the day’s destination: Paradise Cove Beach Resort. Gail Woon, Founder of EARTHCARE and a Director of Save the Bays gave the students a presentation on “Habitat Destruction” complete with visual examples from several Family Islands on the bus ride.“Habitat destruction is one of the five (5) main issues dealt with for Coastal Awareness month in April. Unfortunately, we have examples of unsustainable habitat destruction on many of our islands. EARTHCARE Eco Kids Faciliatator, Tyrie Moss leads the kayak with passengers, Tylea and Rachelle Manchester out to see the Reef Balls in the glass bottom kayak.“The Bahamas has areas where our coral reefs have suffered immensely from unsustainable mega developments, nutrient pollution from land-based sources and are under threat of further destruction by unsustainable mega developers: Caribbean pine (indigenous/native species) forests that have been bulldozed for mega-projects that never materialized (Ginn Sur Mer, West End, Grand Bahama Island), extensive, valuable, healthy mangrove forests that have been destroyed for resort developments (Resorts World Bimini, North Bimini, a Genting Company) and precious blue holes that have been polluted and in some cases obliterated for various and sundry reasons, such as being used as waste receptacles for chemical companies and then closed with a covering of cement or being used as a garbage can for household refuse. EARTHCARE Eco Kids, Team Leaders and Gail Woon, Founder of EARTHCARE at Paradise Cove Beach Resort after a fun day of learning and snorkeling on the Reef Balls. “We were able to show the participants in pictures various examples of habitat destruction from Bimini, Abaco and Grand Bahama etc. Further we were able to suggest possible strategies that are available to the students empowering them to be proactive about their future and the future for their grandchildren,” she said. Upon arrival at Paradise Cove, the proprietor, Barry Smith, explained proper etiquette and behaviour out on the delicate habitat in the water. EARTHCARE Eco Kids preparing to snorkel on the Reef Balls with Gail Woon, EARTHCARE. Reef Balls are used to increase biomass and biodiversity. These Reef Balls are designed artificial reef units. Currently there are over six hundred and thirty-two thousand (632,000) of these deployed in over sixty-two (62) different countries. 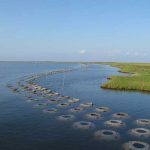 Reef balls help restore our natural reef systems; they protect our shoreline during storm events and help to nourish the direct marine environment. Opportunities are available for individuals and the corporate community to become involved in this amazing programme. The Reef Balls at Paradise Cove Beach Resort with an abundance of fish life. Mr. Barry Smith, the owner of Paradise Cove, saw the gradual degradation of the reefs off shore of the property over time. He did the research and started the Reef Ball Project at Paradise Cove, the largest one of its kind in the country. Ms. Woon took the EARTHCARE Eco Kids out to snorkel on the Reef Ball reef that is now in place at Paradise Cove. The students were amazed to see all of the fish living in the Reef Balls. L-R Cheri Wood, Certified Coral Propagator, Nathanael Smith, Designer of the official EARTHCARE Eco Kids T shirt and winner of the T Shirt Design Competition and Savanna Gibson, EARTHCARE Eco Kids Team Leader as they present Cheri with a shirt and Honorary EARTHCARE Eco Kids membership for her contributions to their learning about the Reef Balls on March 26th 2016. This installation presents unique opportunities for Bahamians to acquire skill sets, like artificial reef building or coral transplantation, which will become a valuable asset as the nation moves forward; protecting, restoring and repairing the damages humans have inflicted to our beloved ocean. L-R EARTHCARE Eco Kids, Nathanael Smith, Tylea Manchester aboard the back of Tyrie Moss, EARTHCARE Eco Kids Facilitator, and Rachelle Manchester, EARTHCARE Eco Kid. Paradise Cove, west of Freeport, was the chosen site for this program due to the owners’ sponsoring abilities and the need of shore protection. Paradise Cove is a TripAdvisor top rated snorkeling destination for residents and tourists alike. Tyrie Moss, EARTHCARE Eco Kids Facilitator assisted the EARTHCARE Eco Kid from the Beacon School, young Tylea Manchester. Tylea could not join the snorkel groups so Mr. Moss took Tylea and her sister Rachelle in a glass bottom kayak to see the Reef Balls up close. Nathanael Smith, student from Martin Town Primary. Nathanael designed the EARTHCARE Eco Kids official T shirt, winning the T shirt Design Competition and a cash prize. The EARTHCARE Eco Kids Team Leaders, Angelina Rahming, Kendira Gembalies, Havana Gibson, Samia Rampersad, Savanna Gibson, and Tristan Rampersad worked hard to keep the students organised and all agreed that they learned a lot during this exciting field trip. • Pay attention to current events. • Question everything as it relates to environmental concerns. • Learn as much as you can about our different habitats so that you understand what it is that we stand to lose by Unsustainable Habitat Destruction. • After you have educated yourself, spread the word and, teach your friends. • Make a project of restoring a wetland or other habitat. • Write letters to Government if you have concerns about any particular project. • Start or sign a petition about your issue. • Join an environmental NGO (Non Governmental Organization) such as EARTHCARE, Bahamas National Trust, Save The Bays, Friends of the Environment, BREEF and many others. EARTHCARE Eco Kids snorkel over the Reef Balls. EARTHCARE would like to acknowledge sponsors Paradise Cove Beach Resort, H. Forbes Charter, and most of all, Ms. Cheri Wood for all of her very hard work with the youth of The Bahamas. This work would not be possible without the cooperation and support from the parents/guardians of our EARTHCARE Eco Kids, we salute you! For more information on how to join, contact: Gail Woon, EARTHCARE, earthcare.bahamas@yahoo.com, or call 727-0797.
thebahamasweekly.com – Bahamas Unsustainable Habitat Destruction vs. Artificial Reef Construction.